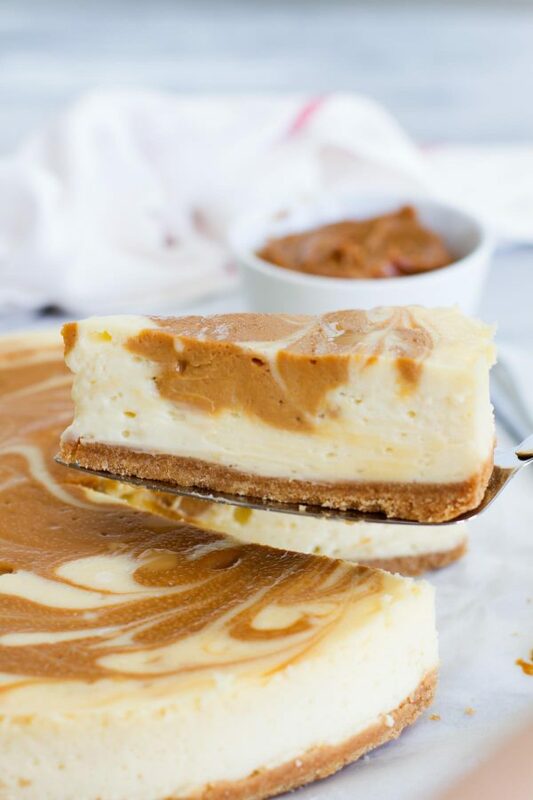 A creamy cheesecake is swirled with dulce de leche in this decadent and delicious Dulce de Leche Cheesecake. This creamy cheesecake is holiday worthy! 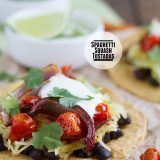 Originally posted May 8, 2007 – It’s almost time for Cinco de Mayo, and I’ve got your perfect dessert! 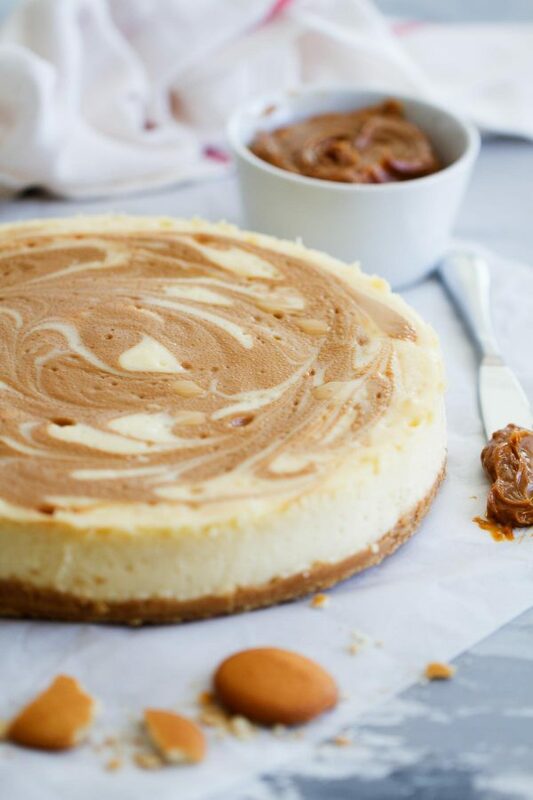 This Dulce de Leche Cheesecake is easily in my top 3 favorite homemade cheesecakes. It is so creamy and perfect. 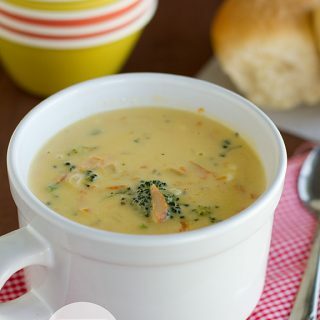 And just what you need after stuffing yourself with tacos and enchiladas. Along with the recipe, I have also included some updates to the post with some cheesecake tips and tricks. So following is the original post, with my added updates. 🙂 I’m so ready for Cinco de Mayo! It’s time for dessert!! When I decided to go for a Cinco de Mayo theme for dinner, I couldn’t resist doing a Mexican-themed dessert. I was tempted to make Tres Leches Cupcakes, but opted for a Dulce de Leche Cheesecake instead. I have seriously been craving cheesecake. I have not made a cheesecake in years, but both Josh and I love them. We make sure to visit the Cheesecake Factory whenever we are in a town that has one. So I did some research and came up with a this Dulce de Leche Cheesecake. When I was in Jr. High, my Spanish teacher made us Dulce de Leche by boiling a can of sweetened condensed milk. While searching for a recipe, I came across this method quite often. Many times it was criticized – saying that this is not the actual way to make Dulce de Leche, but my Spanish teacher had lived in South America for a number of years, so I believe that even though it may not be the authentic way to make it, it still works. The thing about this method, though, is that I get scared that the can will burst. So I tend to steer clear of just boiling the can. You can also take this same method but poke holes in the top of the can to let the steam escape, removing that worry of a bursting can. This way works well, but I have found that it’s not the best at making all of the sweetened condensed milk cook evenly. My favorite way to make dulce de leche is in a double boiler. Just open the can and transfer the sweetened condensed milk to a heat safe bowl that you will place over a small pan of simmering water. You can stir the mixture every now and again to make sure it is cooking evenly. This method ensures an evenly cooked caramel, but it still takes a long time. About an hour and a half. There are even more ways (that I haven’t tried) like in the microwave, in the oven, in the slow cooker, and even in the pressure cooker. But in all honesty, 90% of the time, I just buy it from the store. Yep, you can get it in a can, usually my the Mexican ingredients. Just make sure you are buying the dulce de leche, as there is another can that looks very similar that is not dulce de leche. It does cost a couple more dollars than a can of sweetened condensed milk, but I’m ok with that because of the ease. Do you have to use a water bath? I made this cheesecake 3 times. 3 times in one week, that is. All to ensure that I was getting it just right for all of you. I know you all hate water baths. They take too long! The water leaked into my cheesecake! Believe me – I’ve had more than one comment/email about how I ruined someone’s holiday or party because their water bath leaked. I didn’t want that to happen again, so I tested whether a water bath really made a difference or not. Test 1 – Place the cheesecake on the middle rack, and a dish of hot water under the cheesecake. Kind of like a displaced water bath. I have heard people rave about this method, saying that it works just as well as an actual water bath, but not only did this cheesecake crack in the center, but it cracked many places around the edges, too. In fact, I’ve never had consistent results from this method. Test 2 – I just skipped the water bath all together. It actually wasn’t even on purpose, but I was multi-tasking and completely forgot the water bath. And yes – big crack down the center. Test 3 – I used an actual water bath this time, and this cheesecake was by far the best of the three. No cracks. And not only were there no cracks, but it was so smooth and creamy and the texture was so perfect. So yes – I know they are a pain, but if you want the perfect cheesecake, I’d stick with the water bath. If you don’t care about a crack or two in your cheesecake, by all means, keep it as simple as you’d like to. Now there are tons of different ways to do this online, but I’m just sharing my way. 1 – you have to have a springform pan. I use a 9-inch, which I think is the perfect size for a regular cheesecake. 2 – remove the bottom of the pan, and place a sheet of parchment paper over the round. Place the top of the springform pan over the round, and push it down where the edges line up and close the lever. This gives you the closed springform pan with parchment paper in the bottom, and the edges of the sheet of parchment paper sticking out. 3 – Put 2 pieces of foil on a counter, crossing each other. Place the springform pan in the center, and wrap the pan in the foil, making sure to not only bring the sides of the foil up, but the sides of the overhanging parchment paper as well. Make sure the foil is on very tight. 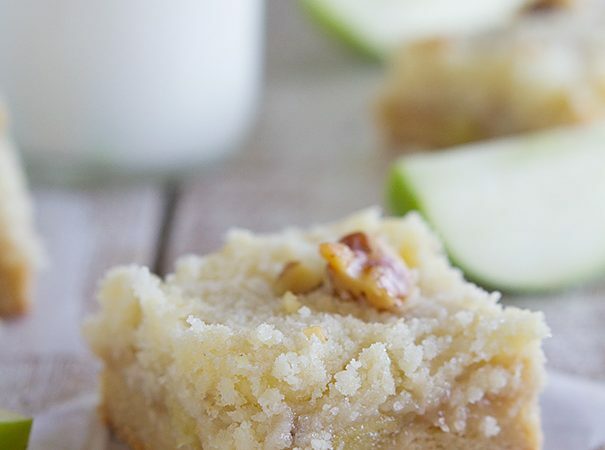 Place this in a pan that is just bigger – I use a 2-inch deep think baking sheet. 4 – once you have poured your batter into the pan, place it on the middle rack of your preheated oven. Fill the outside pan with very hot water, making sure you don’t splash the cheesecake. 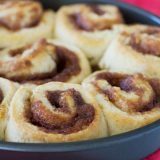 Here are some other tips I’ve seen/heard, but haven’t tested myself: Using a slow cooker liner to put around the pan to keep it dry, using oversized foil to minimize the chance of water leaking between the two pieces, or just not worrying about a crack and drizzling caramel over the top to hide any cracks. Anyhow, I really liked how this cheesecake turned out. It is not a light and fluffy cheesecake, but a rich, creamy cheesecake. My husband had 2 slices when we first tried it, and I wanted 2 (or maybe 3) slices. In fact, we still have some in the fridge that is calling my name right now…. Place the vanilla wafers in a food processor and process until completely crushed. Add the melted butter and pulse a few times until the crumbs are all moistened with the butter. Press the crumbs into the prepared springform pan. Using a flat bottomed glass or measuring cup, press the crumbs firmly, but gently, to make sure they are packed and even. 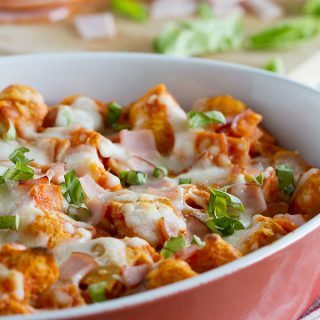 Place the pan in the oven and bake for 4 to 6 minutes, until the crust is lightly browned. Remove from the oven and cool to room temperature. Reset the oven temperature to 325ºF. Place the cream cheese in a large bowl or the bowl of a stand mixer. 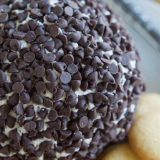 Using the stand mixer or an electric mixer, beat the cream cheese until it is smooth. Add the sugar, flour and vanilla and beat until combined and smooth. Add the eggs one at a time, beating only until combined. Be careful to not overmix. Add the milk and mix just until blended. Measure 3/4 cup of the cheesecake batter and add it to a small bowl. Add the 1/2 cup dulce de leche and mix to combine. 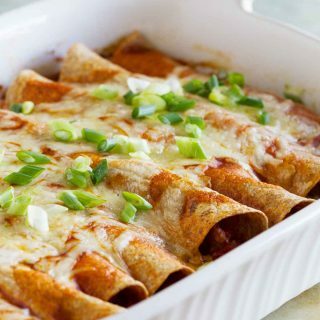 Place the springform pan with the cooled crust into a larger dish with sides that go up at least 1 inch. Pour the plain cheesecake mixture into the springform pan. 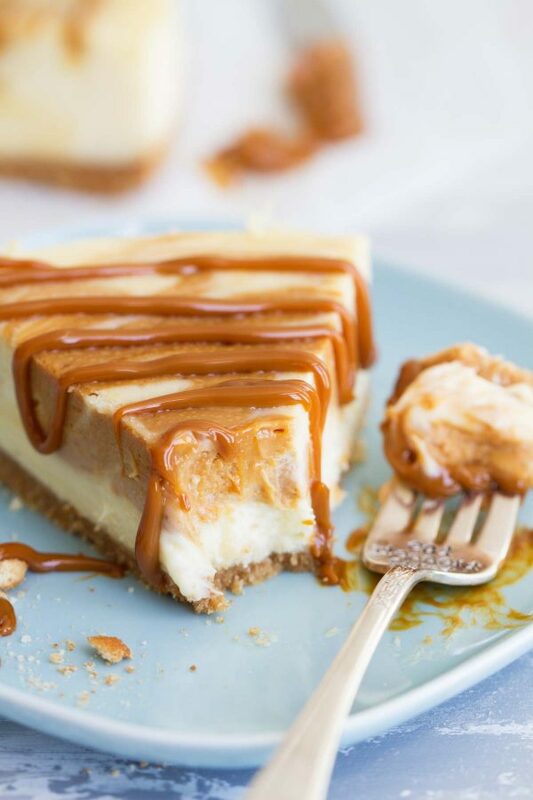 Top with the dulce de leche batter by placing rounded spoonfuls over the cheesecake batter and gently swirl it into the plain batter with the tip of a knife or a skewer. Heat about 2 cups until very hot or boiling. Place the cheesecake in the oven, then add the water carefully into the dish surrounding the cheesecake. Close the oven door and bake until the edges of the cheesecake are puffed and set, but the center should still be a bit jiggly, 45-55 minutes. Turn off the oven and prop the door open. Leave the cheesecake in the oven to gradually cool for about an hour. Carefully remove the cheesecake from the oven, adding extra caution with the surrounding water. 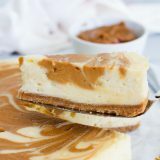 Run a sharp knife around the edge of the cheesecake, then cover the cheesecake and refrigerate until completely cold, at least 4 to 6 hours, but preferably overnight. 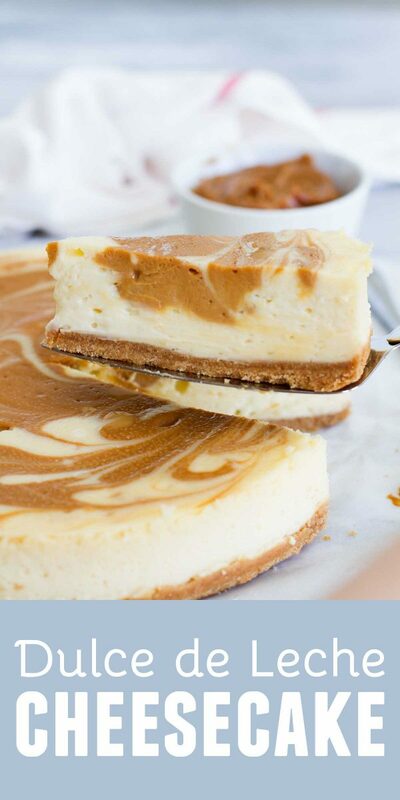 If desired, serve the cheesecake slices with additional dulce de leche over the top. 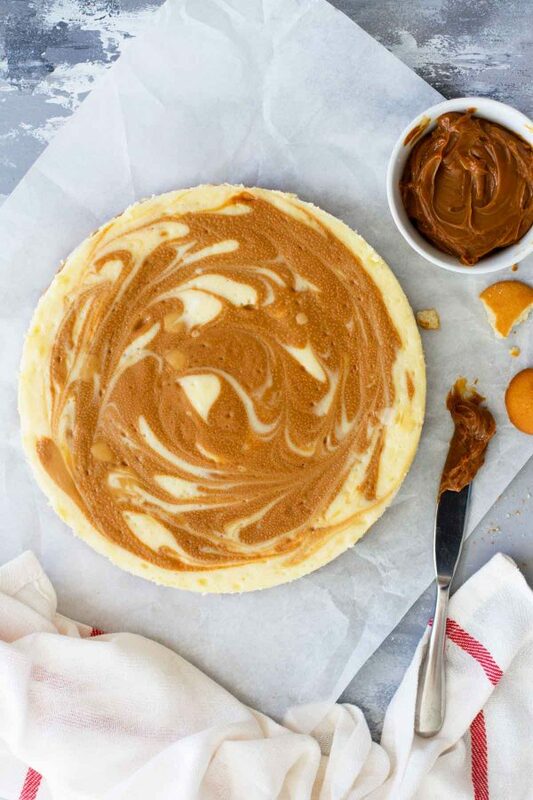 Looks like the perfect cheesecake for Cinco de Mayo…any left? I’ve enjoyed your Cinco de Mayo series – most of all this cheesecake! 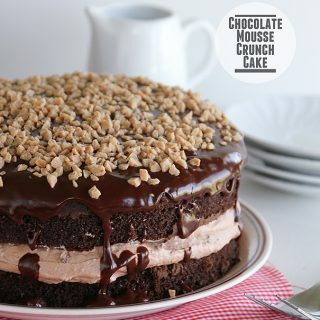 Looks stunning and the extra Dulce du Leche for drizzling pushes way over the top! Yum! Oh Deborah! That looks incredible. I love the Dulce du Leche dripping over ….. yeah … any left? Both the fish tacos and this cheesecake look SO GOOD! Why can’t we just reach in our monitors and take what we want, dammit? Oh this looks so good. 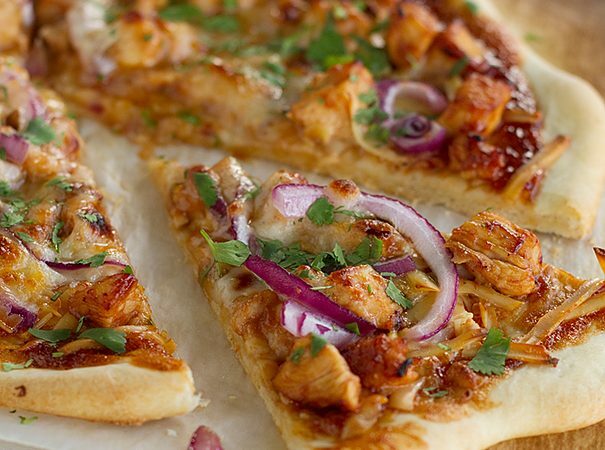 Just simply mouth watering. I need to try boiling a can of condensed milk, it seems like the much easier route to take. That cheesecake looks fabulous. I wish I could send some to everyone – that way I wouldn’t eat the whole thing, which I know I shouldn’t do!! I was tempted to make margarita cupcakes as well but went a different route. Your cheesecake looks incredibly delicious! visiting a cheesecake factory is just such a fantastic thing to do…if i even tried suggesting that to my husband he’d probably give me a “i’ll trade you for a cat” look !Your cheesecake looks really delicious. 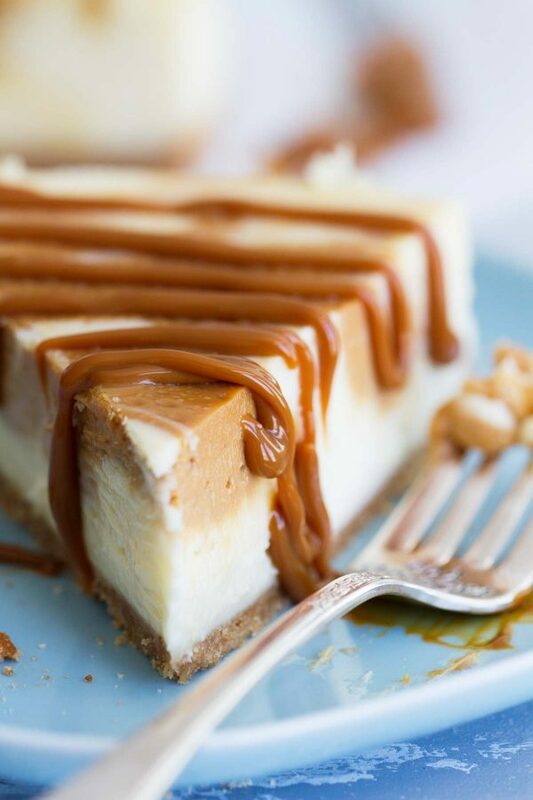 Oh how I love cheesecake… the drips down the side of Dulce de Leche is mouthwatering! That is the only way I have ever made DDL. Now a days you can find dulce de leche (La Lechera -Nestle brand) next to the condensed milk in most supermarkets.However,its very thick compared to the one you made here but you can add some milk and stir it to make it more “running’ like. I can’t believe you didn’t like the argentinean cake! there must’ve been a cheap dulce de leche on that cake.